Find how Temperature stickers work on this link. TL-E labels provide the most value of the TL series labels. 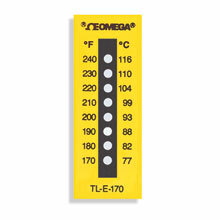 These labels have 8 different temperature ratings on a single label, which give the user the most information about the highest temperature reached. These indicators are supplied 10 or 30 to a pack. Nota: To order pack of 30, add suffix “-30” to Model No.